Uncategorized What is Tire Pressure Monitoring(TPMS) and How Does it work? 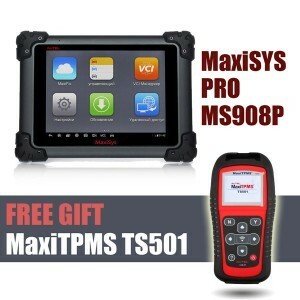 INDIRECT TPMS: WHAT IS INDIRECT TPMS & HOW DOES IT WORK? An indirect TPMS typically relies on wheel speed sensors that the anti-lock brake system uses. These sensors measure the rate of revolution each wheel is making and can be used by on-board computer systems to compare with each other and to other vehicle operation data such as speed. Based on the rate of revolution of each wheel, the computer can interpret the relative size of the tires on your vehicle. When a wheel starts spinning faster than expected, the computer calculates that the tire is underinflated and alert the driver accordingly. So, an indirect tire pressure monitoring system doesn’t actually measure tire pressure. It’s not electronically processing the same kind of measurement you might see with a tire gauge. 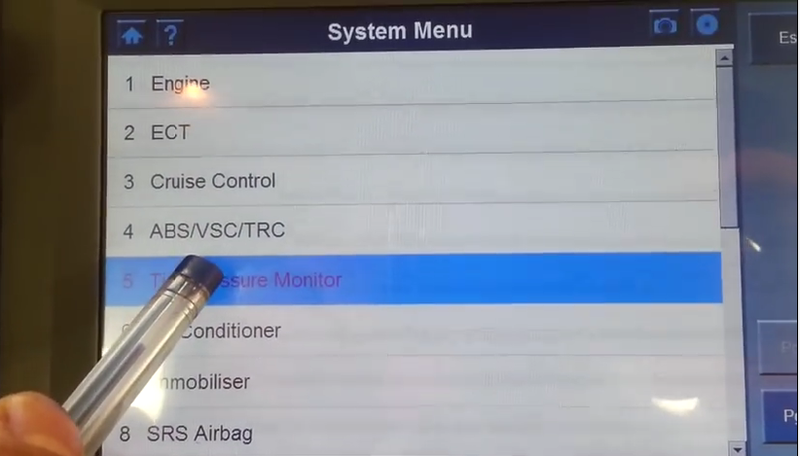 Instead, an indirect tire pressure monitor simply measures how fast your tires are rotating and sends signals to the computer that will actuate the indicator light when something in the rotation seems amiss. 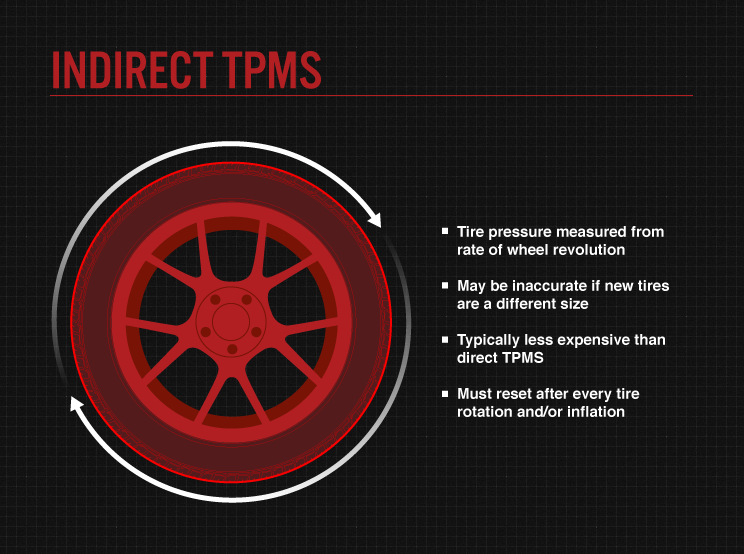 DIRECT TPMS: WHAT IS DIRECT TPMS & HOW DOES IT WORK? Direct TPMS uses pressure monitoring sensors within each tire that monitor specific pressure levels – not just wheel revolution data from the anti-lock brake system. Sensors in a direct TPMS may even provide tire temperature readings. The direct tire pressure monitoring system sends all of this data to a centralized control module where it’s analyzed, interpreted, and, if tire pressure is lower than it should be, transmitted directly to your dashboard where the indicator light illuminates. A direct tire pressure monitor usually sends all of this data wirelessly. Each sensor has a unique serial number. This is how the system not only distinguishes between itself and systems on other vehicles, but also among pressure readings for each individual tire. Many manufacturers use proprietary technology for these highly specialized systems, so replacing a TPMS in a way that’s consistent and compatible with your vehicle will require an experienced, knowledgeable technician. Batteries inside the sensors usually last for about a decade. Though simple, resynchronization may require costly tools. 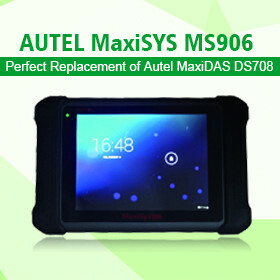 Battery rarely serviceable; if the battery is drained, the whole sensor must be changed. 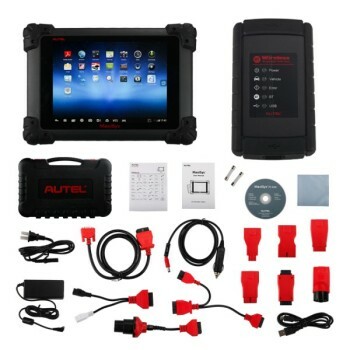 Proprietary systems make installation, service, and replacement confusing for consumers and auto shops. Although the methods may be different, both systems serve the same purpose and activate the same indicator light. 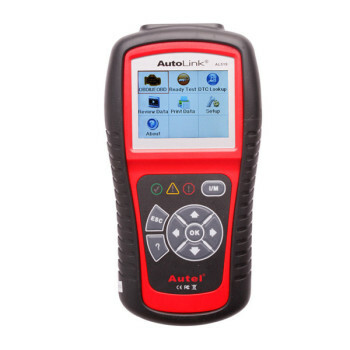 Even though a TPMS can deliver accurate alerts when properly maintained, it’s not a replacement for manual air pressure checks, consider it just another item in your car maintenance toolbox.